Once upon a time, there was a handsome prince (Dan Stevens) who lived in a castle. The prince would throw lavish parties. During one party, a woman (Hattie Morahan) comes to the castle, seeking shelter from the storm. The prince, judging the woman by her haggard appearance, turns her away. What the prince didn’t realize is that the woman was an enchantress in disguise. To punish the prince for his actions, she casts a spell on the castle. The prince is turned into a beast and the servants in the castle are transformed into household objects. To break the spell, he must learn to love another and earn their love in return. Otherwise, he will remain a beast forever. Belle (Emma Watson) and her father Maruice (Kevin Kline) live in a small village. Belle does not fit in with the townsfolk and dreams of a bigger life. Despite being seen as odd, Gaston (Luke Evans), the most desired man in the village, is making plans to marry Belle. With the help of his trusty sidekick LeFou (Josh Gad), Gaston will stop at nothing to win Belle’s heart. One day, Maurice wanders into the Beast’s castle, where the Beast makes Maurice his prisoner. When Belle finds her father, she agrees to take his place so he can return home. 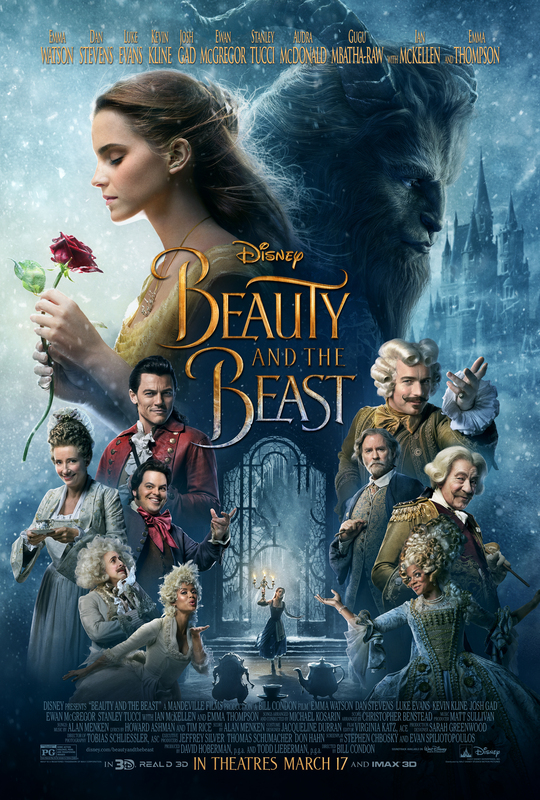 A candelabra named Lumière (Ewan McGregor) and a clock named Cogsworth (Ian McKellen) realize that Belle may be their only hope to break the spell the enchantress has placed on the castle. With the help of Mrs. Potts (Emma Thompson), her son Chip (Nathan Mack), and the rest of the inhabitants of the castle, Lumière and Cogsworth try to get the Beast to change his ways and break the spell before it is too late. Twenty six years after the original, Disney adds Beauty and the Beast to their growing list of live-action adaptations of their classic films. Following the success of The Jungle Book, Disney has found a winning formula to bring these classics to a new generation. The film is mostly an almost shot-for-shot remake of the animated film. It works well not only because of the familiarity and nostalgia, but the original was already so well told not many changes were needed. Where the live-action strays from the animated version actually improves the story. We are given much clearer and more coherent back stories. Most notable is the story of the prince and the spell that has doomed him to life as a beast. Among other things, he is no longer a young boy when he turns away the enchantress. We also get more insight into the lives of the other characters. Emma Watson once again shows why she is such a powerhouse. She plays Belle perfectly. Luke Evans and Josh Gad have great chemistry on scene. Evans has the right mix of bravado and arrogance to bring Gaston to life. Gad brings the comic relief without becoming the bumbling buffoon LeFou was in the cartoon. The rest of the cast rounds out the ensemble as the household objects. For those of you who have heard of or are concerned with the “controversy” regarding LeFou, don’t let that scare you away from the movie. First of all, it is a very minor story line. There is no “agenda” being pushed onto you or your children. Secondly, it’s 2017. Get over it. Kudos to Disney for having the courage to include a gay lead character. Disney’s Beauty and the Beast is a must see. Kids will love the story and parents can relive younger days when they first saw the film. I didn’t see it in 3D, but I can definitely see how it would add to the movie.